Do you offer childcare during service? We offer Nursery through 6th grade during each worship service. Our junior high group meets during first service, and our high school group meets during second service. If you’d like to know more about our Children’s Ministry, go to our Children’s Ministry page or contact Pat Wilkes. Do you teach Calvinism at FBC? What’s the background of your pastoral staff? Our pastors were all trained at evangelical seminaries. Chris graduated from Talbot Seminary in the 1982, and will receive his doctorate from The Master’s Seminary in 2018. John graduated from The Master’s Seminary in 1999 and received his doctorate from Southern Baptist Theological Seminary in 2011. Nigel graduated from The Master’s Seminary in 2000 and received his doctorate from there in 2013. Do you belong to a denomination? No. We believe the Bible teaches that the church is to be led by a plurality of elders who are directly responsible to God for that body of believers. For more on this topic, see our Doctrinal Statement on “The Church” and the “Church Government” section under Life Issues. Do you have a youth group? We do. In fact, we have a very active youth ministries to both junior highers and high schoolers. Know that it is not just a fun-and-games group — they dig heavily into the Word together. If you’d like more information about it, visit our youth page or contact Jon Stead (Junior High), Morgan Maitland (High School). Do you have midweek small groups? We actually have a variety of groups that meet for all different purposes at various days and times. Throughout the week are Community Groups for adults that want to grow in Christ and in community with one another. On Sunday mornings, we have equipping classes for people who are looking to plug in and get grounded in the Word. 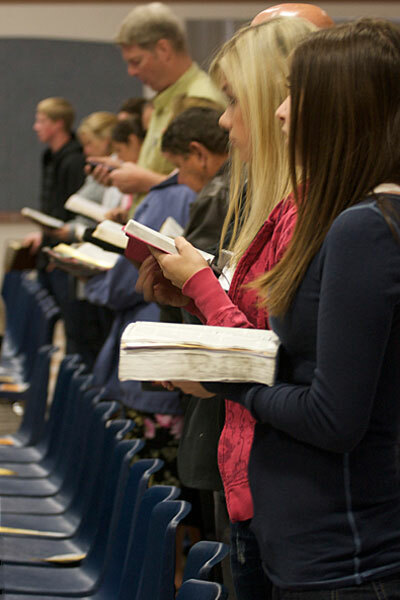 And some believers in our church also casually gather together just to pray and study the Bible together. Is FBC a congregational church? Are we congregational? Hmm. We are congregational, in the sense that the church is not a building, but a body of believers. But we are not congregational in the sense of church government. We would be an elder-led church. We believe that this is the biblical model for churches. For more on this, see the section on “The Church” in our Doctrinal Statement and the section on “Church Government” in Life Issues. How can I get plugged in and get to know people? Come to church each week and linger afterwards during the fellowship time. Invite some people out to lunch or dinner, rather than waiting for someone to approach you. Do you practice church discipline? Because we believe that God has called the church to be pure (not filled with people who live for themselves) and has commanded us to pursue those who wander into sin (Matt 18:15-17, Gal 6:1-2, Titus 3:9-10, et al), Faith Bible Church does believe in and practice church discipline. If you’re wondering what church discipline is — “Church Discipline” is a term that has been used to describe the corporate body’s loving involvement in the personal lives of professing believers who are struggling with sin. Church discipline is always to be done with an attitude of deep humility and gentleness with the express goal of repentance and restoration. For more on what this process is and looks like, read the “Church Discipline” section found in Life Issues. Do you believe in the gifts? Yes. Absolutely! But the question is not do we believe that believers are spiritually gifted by God, for the Bible is extremely clear on that (e.g., 1 Cor 12:4-7, 11; Eph 4:7-8). For the reasons we’ve come to this conclusion, check out the “Spiritual Gifts” section of Life Issues. How is FBC involved in mission’s work? The Bible is clear that we are to be so in love with God that we naturally, joyfully and regularly tell others about Him. It is our expectation that every Christian within our church will be declaring God’s greatness to others, telling of our lost, sinful condition and the reconciliation available through the blood of Jesus Christ. The job of outreach is not for the pastor or the evangelist — it is the responsibility and privilege of the whole church. To that end, we are striving to be strategic in the local and international missions work that we participate in. Our current targets for impact are Murrieta, Mexico and overseas in Europe and Africa. The answer is that we like “biblical” music — and, no, we don’t mean lyres and harps. We like “biblical” worship in the sense of John 4:24, “those who worship Him must worship in spirit and truth.” Our great passion is not about styles, which change with time, but with truth, that is ageless. So then, our foremost concern is for the content of the songs, rather than the style in which they’re embodied. Whether it’s a hymn or a contemporary praise song (and we do sing both), we want to make sure that it’s “of substance” in content, rather than being merely catchy or singable. This is because the elders of the church are accountable to God (Heb 13:17) for how & what the church body learns to sing as praises to our great and mighty God. There is a clear pattern in the Bible that God sets aside certain men for a lifetime of ministry. This calling by God was always recognized and affirmed by other godly men around those individuals. In the New Testament, church elders began to physically lay hands on new leaders as a tangible proof of their affirmation of that individual for church leadership. The cultural institution of ordination found in the States is descended from that early process. It is not biblical, but man-made. This does not make it inherently bad, but neither can it be argued as necessary. After that disclaimer, you’re probably expecting to read that our pastoral staff are not ordained. To the contrary, our current pastoral staff members (Chris, John, and Nigel) have been examined and ordained by the churches that sent them out. What Bible do people at FBC use? Among people in the body, there is quite a variety–most prevalent being NASB, NKJV, ESV and NIV. On Sunday mornings, The New American Standard Bible (NASB) is used on Sunday mornings. Why? The textual basis and formal equivalence of the NASB is preferable to the NKJV and NIV, though admittedly not quite as readable. The more recently published ESV is a very good translation, but since only a small percentage of the church currently uses that translation and most of the leadership of FBC has grown up using the NASB, we have not yet chosen to switch over.